We love to snorkel and have been lucky enough to enjoy it on three Hawaiian Islands, in Costa Rica, in Thailand and in the Caribbean waters of Mexico. Wherever we travel, we always pack our snorkel gear. 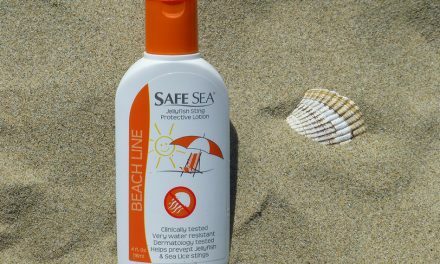 We have learned that it is important to have quality gear so that you don’t waste your time fiddling with the adjustments instead of enjoying the sea life. 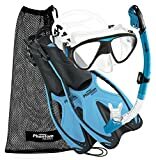 Snorkeling gear can be purchased in a huge range of prices. The lowest priced gear is often a waste of money because you will not enjoy your snorkeling experience if you mask leaks, your fins keep falling off, or your snorkel keeps getting filled with water. This is something that I have learned the hard way! We’ve discovered that if you intend to snorkel in foreign waters, it is vital to bring your own equipment. The equipment available from the tour outfitters and rental shops was of very poor quality. Buying gear was also a no-win proposition as the selection was poor and the prices were much higher than we pay in the U.S. 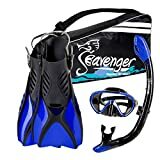 This is a medium quality snorkel set and is perfect for the beginner. 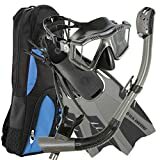 It was the second snorkeling set that I purchased and it served me well for years. The fins are the short style, which is perfect for packing in a suitcase. They have plenty of power for snorkeling and are comfortable to wear for hours (make sure to get the correct size). 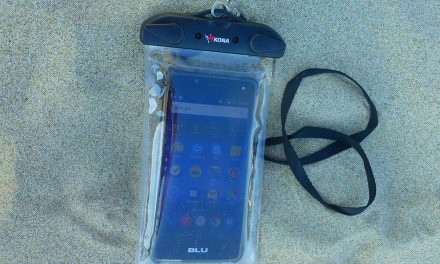 The snorkel is engineered to keep water out and works well. I find the tube easy to breathe through and the mouthpiece fits my mouth comfortably. I don’t get tired from having it in my mouth, even for hours. It is slightly angled so it fits nicely beside the head. You can dive underwater with the snorkel and the water stays out and it is easy to clear if some water leaks in. I enjoyed using this mask. The silicone skirt is not flimsy, like some brands. The view is good and I felt like I could see around me easily. I also liked the quick release buckle which makes it much easier to put this mask on because you don’t have to pull it over your head if you don’t want to. I eventually replaced this mask because it didn’t fit my face as well as I wanted. 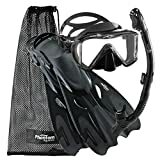 I purchased a mask at a dive shop in Thailand, and it cost more than this whole set! If you’ve found that your face is hard to fit for a snorkeling mask, you may want to purchase one at a dive shop, but it will be lots more expensive. Amazon reviewers reported that they were permitted to return the mask for exchange if it didn’t fit properly. 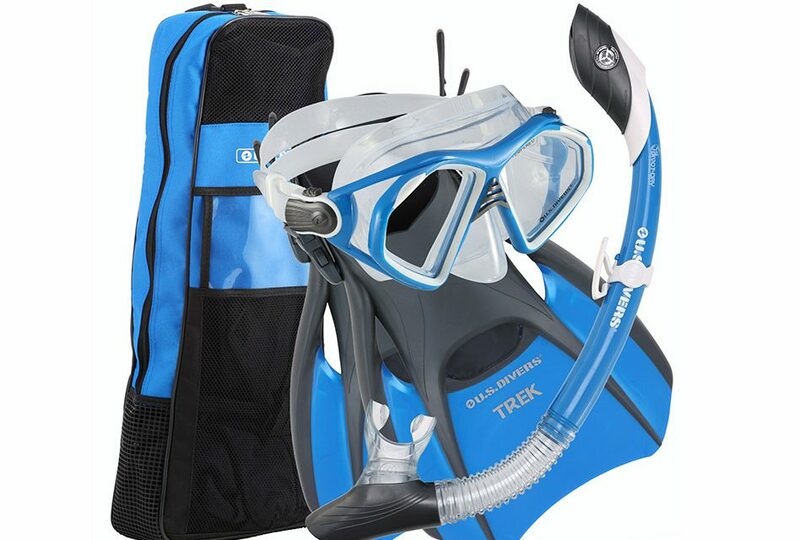 Summary Good quality and full featured snorkeling set at an attractive price.